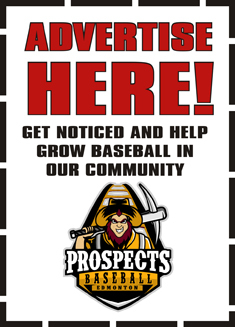 The RE/MAX Field era for your defending West Division Champion Edmonton Prospects started off with quite a bang Friday night versus the Brooks Bombers. The pre-game thunder heard from the heavens above was replicated repeatedly throughout the ballgame by our Prospects’ bats leading them to a 10-1 win. The Prospects would twice load the bases in the 1st inning and cash in two runs. Collecting the first RBI of the season with a single would be newcomer Marion McLean. One batter later, the returning Erik Sabrowski would bring home another Prospects' veteran Nick Spillman with a sacrifice fly. The bases would once again get drunk in the 2nd inning and again McLean would earn another RBI this time drawing a walk. Heading into the third inning Prospects starting pitcher Noah Gapp had gone a perfect 6-up-6-down. The only run he would allow would come in this frame when the Bombers' Ashton Ray would hit a 1-out double and come around to score on an error. Gapp would go the distance in the season opener spreading out only 4 hits and striking out fourteen (14!) batters! Gapp definitely showed why he is garnering some consideration in the upcoming MLB Draft on June 12. One of the longest tenured Edmonton Prospects Derek Shedden would bring home rookie Prospect Travis Ouellet in the bottom of the 3rd to give the home team a 4-1 lead. The offence would explode in the bottom of the 5th ballooning the lead to 8-1. Jake Lanferman would come up with the bases loaded and promptly empty them with a double. McLean would continue his big night at the plate by driving in Lanferman. Zane Takhar and Spillman would collect RBI singles in the bottom of the 6th to bring us to our 10-1 final score. Play Of The Game: After only being able to build a 3-run lead with multiple bases loaded situations, which allowed the visiting Bombers to hang around, the 3-RBI double by Jake Lanferman in the 5th inning put this game out of reach. Player of The Game: Noah Gapp. A complete game, 14 K performance makes him the obvious choice. He threw 83 of 107 pitches for strikes which included striking out the side in the 4th inning. Next home game at RE/MAX Field: Thursday June 8th vs Okotoks. Thursday nights are once again Thirsty Thursday’s!